The beach is calling, and I must go! I am on the 6th day of my mid-year travel madness (halos isang linggo na pala akong wala sa bahay) and am starting to feel home sickness again. Sadyang hindi ata ako talaga para sa pang-mahabaang byahe. I miss the comfort of my bed and being in front of my PC. But I can't go home just yet. 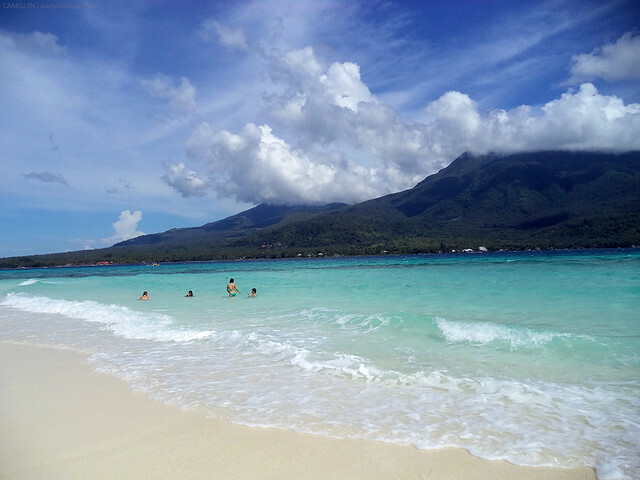 There's still one more destination in my list that I can't let past—the White Island of Camiguin. Coming from the summit of Mt. Timpoong, the highest in the whole of Camiguin Island, we descended back to the lowlands and headed next to the famous sandbar off the coast of Mambajao. Literally, a summit to sea adventure. 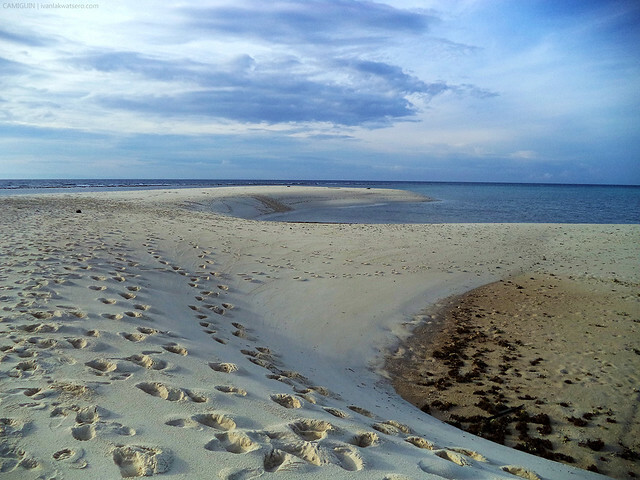 White Island of Camiguin, the white dot off the coast of Brgy. 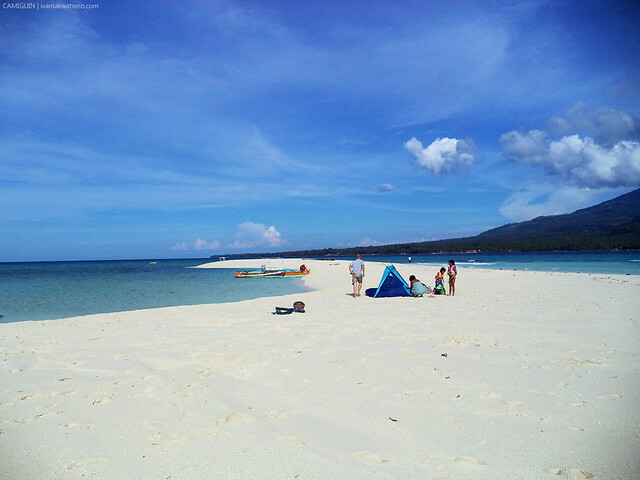 Yumbing in Mambajao, is actually a sandbar of very fine white sand. Getting there is not a problem at all, as boats are readily available at the docking area in Brgy. Yumbing. Since our lodging place is located in the same barangay as where the boats to White Island are docked, getting to the place was extremely convenient and easy for us. And not just that, our lodging place also let us use their boat at a discounted price. From the usual P500, we got it at P300 only! happy thrifty travelers na naman kami. en route to the island. we sailed to the province's famous beach at 1:45 PM, and after only 10 minutes, the target place was reached. 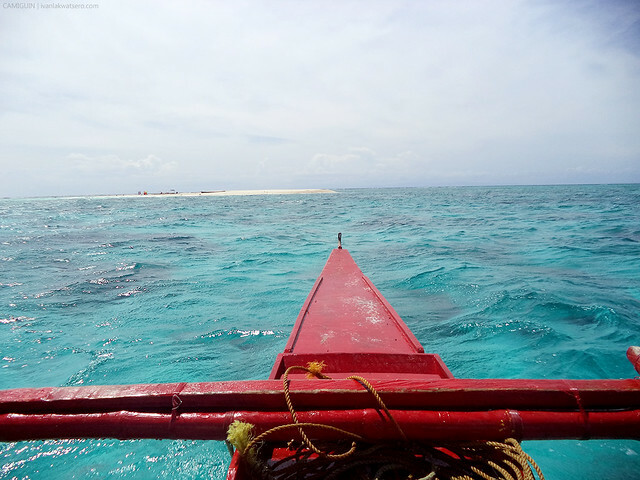 It was around 2 PM when we landed at the famed sandbar of Camiguin. I've never set foot on a sandbar before, so naturally, I am pretty much ecstatic with this another first time event of my life. It felt so amazing the moment I stepped on the soft powdery sand of White Island. Sa sobrang tuwa ko, napatakbo ako. I was too happy that I totally forgot that I was running unprotected from sun's scorching heat (nognog na naman ako pagkatapos netong trip na 'to). Since it is entirely a sandbar, not at least one plant exists on its exposed surface. I spotted a flock of sea birds and some half naked foreign tourists enjoying the beach, but other than those, nothing else can be seen in this lump of fine white sand. It was an empty paradise. Mt. Hibok-Hibok (center) and Mt. Vulcan (right) as seen from White Island. 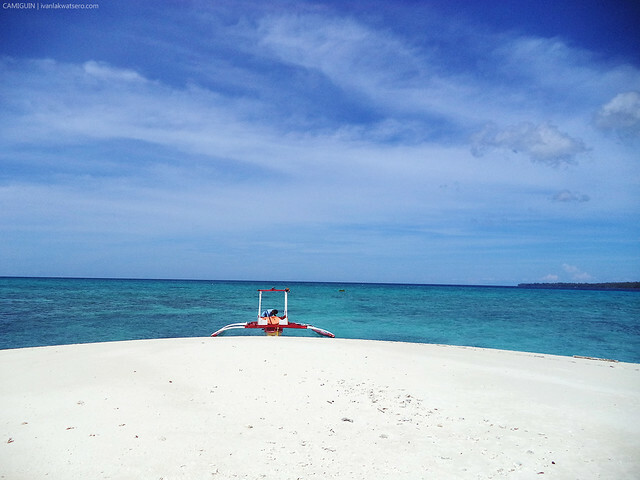 Definitely, you won't find any shade in this bare sandbar, bilad talaga kung bilad. No one braved to build one, even a simple shack made of light materials. Obvious it is because the whole White Island gets eaten by the sea everyday when it is high tide. The clear turquoise water is as well very inviting. No will leave the sandbar without taking a dip into it. If only I brought my snorkeling gear, I would go and explore the underwater scenery too. Sometimes, fishermen would also go here to sell their freshly caught bounty from the sea. According to some blogs, sea urchin is the best seller in this island. this is certainly one of the best spots in this province. White Island is so beautiful and picturesque. Every corner is worth taking a photo. We even planned to stay in the island until dusk hoping that we will capture the majestic sunset as well. the soft sand. ansarap sa paa. As the dusk draws near, the more we felt famished, hindi pa pala kami nakakakain ng mabigat mula pa nung umaga. So by 05:30 PM, we returned to the mainland and went straight to the nearest restaurant. What followed next is a celebratory seafood dinner just for the 2 of us. This wrapped up our great stay in this great tiny province. Down to the last day of our trip. Uwian na! From Camiguin Island to Benoni Port to Balingoan Port to CDO city to Laguindingan Airport. 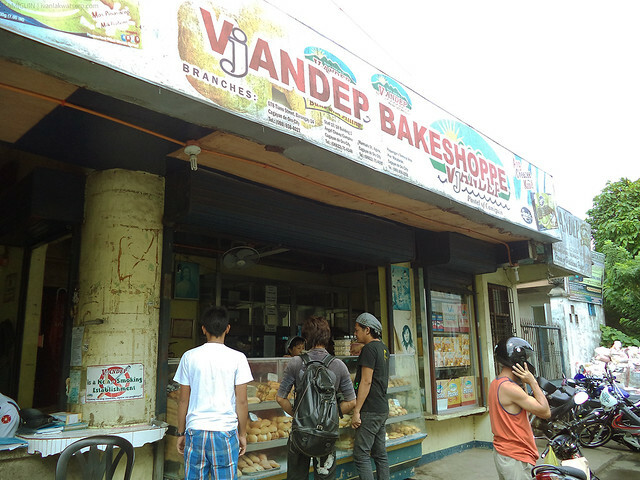 before we left Camiguin island, we bought pastel at Vjandep Bakeshop for pasalubong. Pastel is the native bread/delicacy that originates in this island. A must try! Nothing rally big happened in the last day of our epic adventure in Camiguin except for that adrenalin-pumping race to Laguindingan Airport. We would've missed our flight if it wasn't cancelled that afternoon. Yep, we flew all the way from Camiguin Island to Laguindingan Airport only to find out that our flight got cancelled (kasagsagan kasi ng habagat sa Manila nung mga panahon na ito). So we got home the following day (August 22, 2013). This Camiguin Island adventure as well as my Mt. Apo hike via Kapatagan Trail makes up my 6-day mid-year travel in Mindanao. Memorable experiences! Big thanks to all who joined in my adventures. 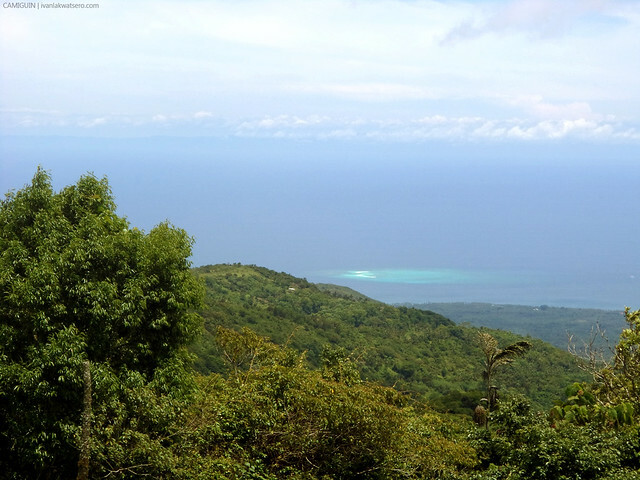 This post is Part 5 of 5 of my Camiguin Island travel series. Check the following links for the other stories. I rely on what you think about the place, Ivan. 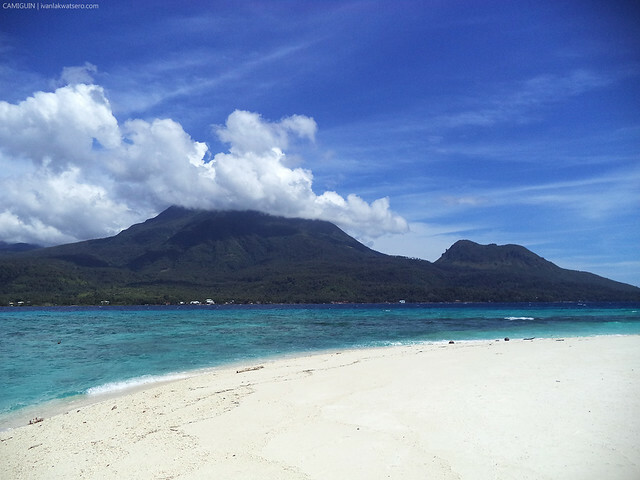 Hope I could also set foot on Camiguin in the future. hi! i hope you could postyour IT and Expenses (specially yung rate ni Mang Roland) pati na rin kung san kayo nagstay. thanks! The best spot in Camiguin!